� 2009 Addleton Academic Publishers. All Rights Reserved. Background: Over the last century, the claim has been made that suicide is always, or almost always, the result of mental disorder. Aim. 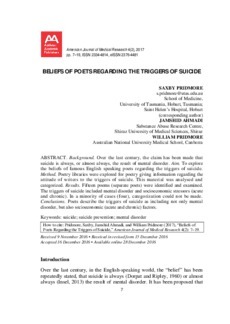 To explore the beliefs of famous English speaking poets regarding the triggers of suicide. Method: Poetry libraries were explored for poetry giving information regarding the attitude of writers to the triggers of suicide. This material was analysed and categorized. Results. Fifteen poems (separate poets) were identified and examined. The triggers of suicide included mental disorder and socioeconomic stressors (acute and chronic). In a minority of cases (four), categorization could not be made. Conclusions: Poets describe the triggers of suicide as including not only mental disorder, but also socioeconomic (acute and chronic) factors.